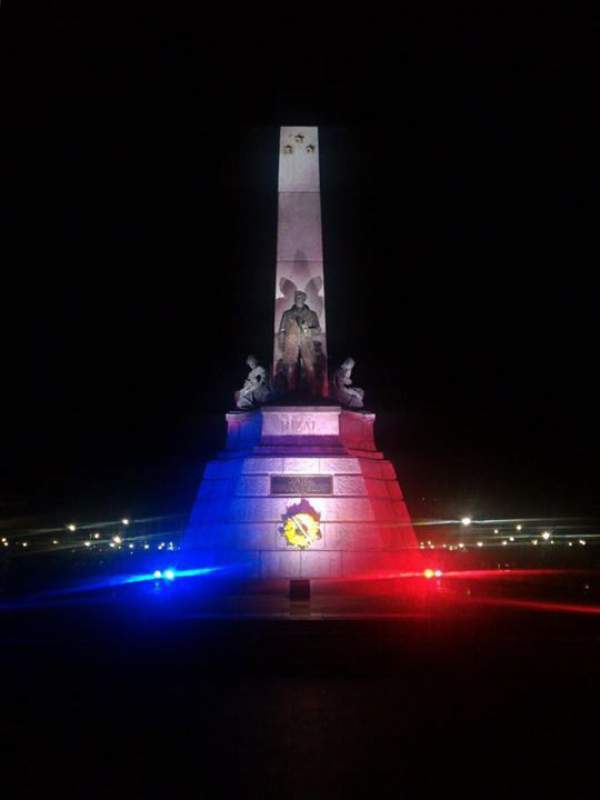 LOOK: Rizal Monument lights up in blue, white and red in solidarity with France - Balita Boss! The Rizal Monument in Luneta, Manila has been lit up in France's national colors in a sign of solidarity with the European nation in the wake of Paris's terror attacks. The photo was shared by the official Facebook Page of the Philippine Department of Tourism's campaign, "The Philippines". "In solidarity with the people of Paris, the Philippines lights up the Rizal monument with the colors of the French flag," the photo's accompanying caption reads. The photo also showed a message by President Benigno Aquino III on the Paris attacks. "We stand with France now, in the firm belief that the light must never dim in Paris," Aquino said. According to French officials, at least 129 people died and many wounded in the November 13 coordinated attacks across Paris.